What dog wouldn’t love to have his water bowl turn into a fantastic flying disc? You’ll see man’s best friend literally go into a tailspin with this convertible, packable water bowl/fetch toy. Made by Paww, a design-focused pet products company, the soft bowl is splash resistant and holds a good draft of cool water for your pup. Then simply fold the outer wall in half and it’s airborne for a great game of toss/fetch/catch. 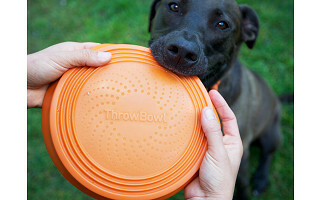 Made of super k9Flex elastomer, the ThrowBowl is just what your dog needs on the dog days- a nice cool drink; then whamo, it’s a fun toy. 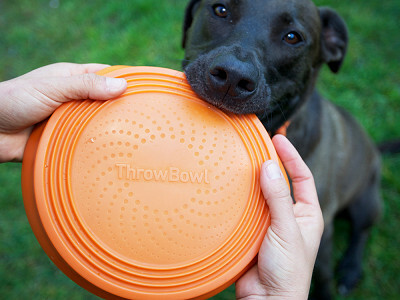 What dog wouldn’t love to have his water bowl turn into a fantastic flying disc? You’ll see man’s best friend literally go into a tailspin with this convertible, packable water bowl/fetch toy.